Depending on the application requrements, Rockmas processing and storage unit Gpm Live can be hosted on site or in Rockmas cloud. Rockmas products in overview figure above corresponds to the thicker linees. Rockmas products can be used alone or coexist with existing drilling solutions. Our customers can pick the products from our product suite to meet their requirements . Rockmas DrillRig product is an operator friendly big screen pc, used by the operator throughout the navigating, leveling and drilling process. Also shown are the instant rock properties while drilling. ◾ 2D and 3D viewer, showing live info from holes, rigs, road networks, etc. ◾ Admin tool for setting up time codes, shift rosters, shift crews, machine faults, etc. ◾ Full dispatch function used to monitor the drilling process. A responsive web application for showing drilling statistics and rock properties. It also provides support for customers to configure their own reports. 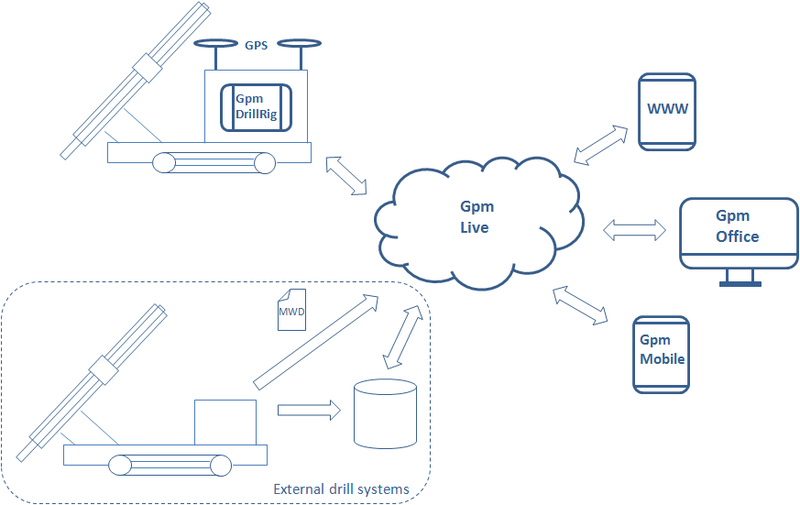 A central unit which processes and routes data from different sources, such as Gpm DrillRig or other machine control systems, to Rockmas Gpm Office/Web/Mobile. This service can either be hosted on site or on Rockmas Cloud network. Gpm Live also provides many Web Service endpoints, hence enabling other systems to be integrated.